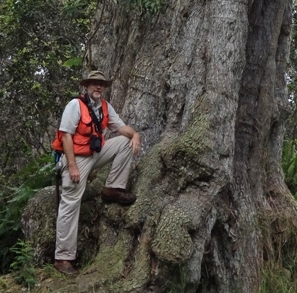 JB Friday is the Extension Forester for University of Hawaii and sits on the PFX Steering Committee. Photo: JB Friday. In "Partner Perspectives" we get to know the diverse people, roles, and views of wildfire management in the Pacific. JB Friday kindly spent some time with us to share about his experience as a forester working in fire-affected areas and enjoying native plants wherever he goes. Pacific Fire Exchange (PFX): What first sparked your interest in wildfire? JB Friday (JBF): When I was in the Peace Corp in the Philippines, all the trees I planted in my first year there burned up in dry season grassland fires. Part of our mandate was to reforest areas of tropical, seasonally dry, fire-prone grasslands which burned every summer. The idea was to shade out the grasses by planting trees and therefore stop the fires. We were in four- to five-foot tall imperata grass, hacking it down with machetes and sticking tree seedlings in there. That reforestation effort failed spectacularly. People were lighting the area to rejuvenate the grasses for grazing and to clear the land for farming crops. Fire is the easiest way to clear land if your main farming tool is a hoe. I learned my lesson and after the first year, stopped planting trees in the grasslands. Later, the farmers started planting trees in fallow fields after they’d harvested their crops. The grasses were under control in the crop fields. After planting the tree seedlings in the fields, they could cultivate the plots for another year or two, and by that time the seedlings were big enough to have a head start on the grass. Since then I’ve seen forestry agencies all around the world continue to get their tree plantings burned. I guess foresters tend to be stubborn and not so akamai on the social side of things. Forestry comes from an old-school authoritarian approach, rather than “We will listen to what people want to do and help them do it.” In the Philippines the forestry agency thought all those fuels were theirs to manage, so they wanted to plant trees. The local farmers thought it was their land and they wanted to graze animals. The foresters would come in and plant trees and the farmers would come burn. That dynamic of very different views on who has the right to manage the land, and for what purpose, occurs all over the world. You’ve got to work with the local people to accomplish anything. 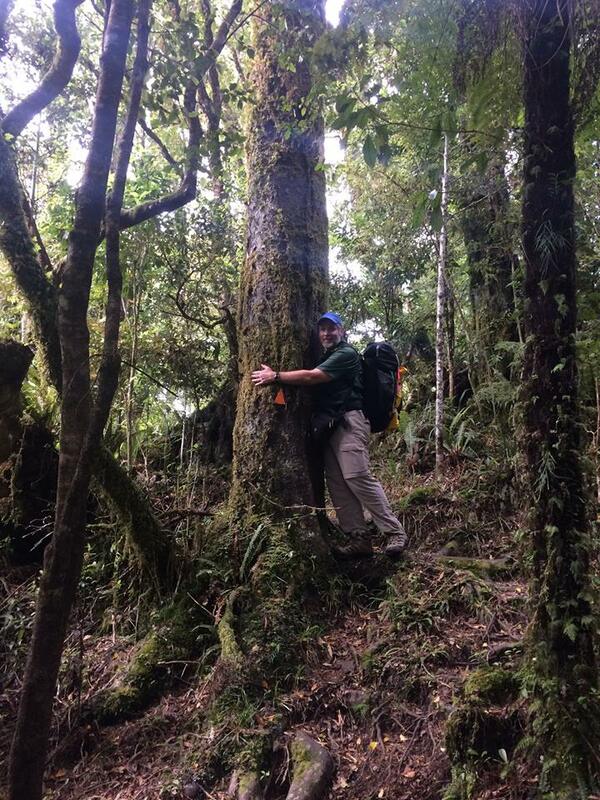 A true tree-hugging forester, JB checks the diameter of a Podocarpus. Photo: JB Friday. JBF: My role is helping people do a good job of managing their forests. About half of my clients are private land owners who typically want to plant trees or take care of their forests, and half of my clients are professionals seeking technical advice on projects and programs. Some of what I do is provide individual advice, in answer to questions like “What kind of tree can I plant here?” My four main programs right now are Rapid ‘Ōhi‘a Death (ROD), koa forestry, nurseries for forestry and restoration, and peer-to-peer learning. Peer-to-peer learning is based on the concept that most people learn from others like them - they see what their neighbor is doing, then they want to do it, too. We facilitate that kind of learning through a Peer-to-Peer learning program called Forest Stewards where landowners who take care of their forests can serve as good examples to their neighbors. The big issue right now is Rapid ‘Ōhi‘a Death. Many people contact me for individual advice on what’s going on with ROD – where it is, how it will affect their trees, how it moves around, and what they can do about it. I also do a lot a community talks, ranging from a ROD Symposium with 75 people to community talks in Puna subdivisions with six people around a plastic table. While everyone would like a professional to come out to their property to check things out with them, we don’t have enough people for that. So I’m trying to create extension materials – written, for the web, and social media - that people can use and understand. I read a lot of scientific papers and try to be the guy who understands all the science that’s going on and also understand what the land managers and landowners need to know so I can share useful information with them. Fire intersects with my work through the nurseries and reforestation program, mostly in the western Pacific. I’m working on better soil and fertility management for reforestation projects on Guam, Yap, and Rota. These are all fire-prone sites where they’re putting trees in the ground in hopes of shading out the grass. There are some really poor soils in these areas, with a mix of reasonably good soils. In the poor soil areas there are trees that were planted 20 years ago and are no taller than me! We take soil samples to get an idea of whether a place needs mulching, fertilizing, liming, things like that. We know a lot about the fertility and management, so the challenge now is determining the practical actions for a wildland reforestation effort. JB and Clay Trauernicht represent PFX at the 2018 Hawaii Wildfire Chili Cook-off. Photo: JB Friday. PFX: Describe an experience in partnering with others. JBF: The Rapid ‘Ōhi‘a Death program has been a really fruitful and involves many partners. There were many folks on the original team, including myself, Flint Hughes at the Forest Service, and Lisa Keith at USDA Agriculture Research Service when we were figuring out the disease, where it was, and what was happening to the trees. We also partnered with Division of Forestry and Wildlife (DOFAW) to monitor what’s happening on state lands, with the Big Island Invasive Species Committee (BIISC) for some on-the-ground management, and the Hawai‘i Department of Agriculture, who chimed in with a quarantine to prevent it from moving off the Big Island. It’s been a really good partnership. Rapid ‘Ōhi‘a Death is such a big threat that everyone realized the importance of doing something. We’re all on the same page – we all want the ‘ōhi‘a to live. In contrast, while nobody wants wildfire in Hawai‘i, people still like to do things that create conditions for wildfires. The old-time ranching industry had cattle roaming everywhere which created these big grasslands. I don’t think the managed pastures burn very much, but unmanaged grasslands are a concern. And another example - fountain grass was brought in for landscaping. We’re not all on the same page with invasive plants because most of them were brought in by people for a reason, so they have their champions. PFX: Do you have any unanswered questions about wildfire? JBF: How much does grazing actually control fuel loads in a practical sense? Yes, it absolutely would if you had a confined managed herd and with pulse grazing and you grazed it all down to the ground – I’ve seen that happen. But does the way we’re doing it in Hawai‘i - having a few cows on a large landscape - really make a difference in fuel loads? How intensive does management have to be before it makes a difference? With the low intensity management I see in drylands areas it’s difficult to see whether grazing is making an effective difference in fuel loads. JB on the island of Yap, documenting his botanical finds. Photo: JB Friday. PFX: How do you like to spend your free time? Part of my motivation is also interest in biodiversity as a naturalist. I really like seeing different plants in different places. I can go to Guam and see the same sort of trees around the hotels that we have in Hawai‘i. But it’s something special if I get to visit one of the wildlife refuges and see native Guam plants that we don’t have in Hawai‘i. Each island has its own native plants. Some are old friends that we see on many different islands and some of them are unique to each island and that’s what makes a place special. (JB maintains and regularly updates an extensive photo collection you can view here). JB stops to appreciate a large Acacia koa tree. Photo: JB Friday. JBF: Probably my most enduring accomplishment when I was in college was laying out a ski trail that people are still using today. I was going to Dartmouth College in New Hampshire and working for a lodge in the mountains. At the suggestion of the lodge manager I traced on a map the route of some old logging roads from 50 to 100 years before, linked those together, and flagged that area to make a ski trail. Over the following year we cleared it for a ski trail. Now it’s a hiking trail in the summer and a cross-country skiing trail in the winter. I’ve gone back to visit it. In fact, both of my kids were working at that lodge this past spring (of 2018), so went up there to see them in June. Both my daughter and son like the outdoors – they were born and raised in Hawai‘i and spent a lot of time with me and my wife Katie out of doors.